"As soon as I saw the most recent MINI ad, I thought of one that was across from my school for a few months and lo and behold, you had it! In Part II, the photo at Flickr was taken right across from my school. 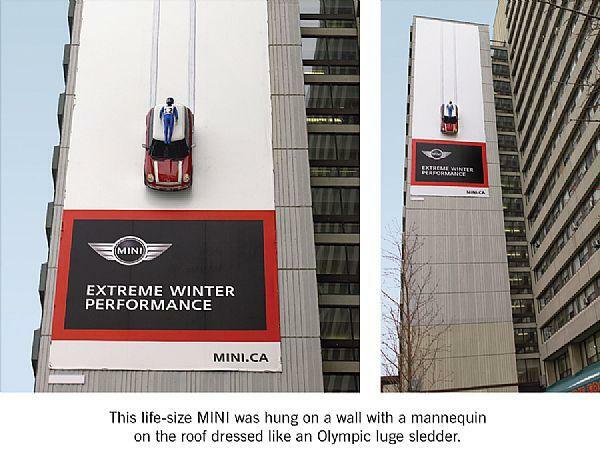 That Mini that they put up there (and which was made of fibreglass or plastic, I believe) was put up with a large crane and actually fell down later! The fibreglass luger was broken, but I don't think anyone was really injured. It was never put up again. For a few weeks, the billboard looked rather silly without a Mini on it. Then the thing itself got taken down. I wish I had photos. The cops showed up when it fell. That photo was made at the intersection of Bloor Street West and Huron street, it's on the side of a cheap condominium (I think it's a goverment-run housing place) in Toronto, Canada and the store under it that you can see a bit of is 'G's Fine Foods'." Dunno. Maybe it was a part of the whole stunt.